Want to get as close as Humanly possible to a UEE battle carrier without joining the Navy or committing terrible acts of piracy? Nul is the place! One of the earliest systems charted by Humans, Nul was discovered in 2290 by NavJumper Antoine Lebec. Contemporary (and oft-disputed) folklore claims that the system’s name comes from a misunderstanding, where Lebec replied “nul” he had not found anything interesting in the system. Nevertheless, it remains the sole star credited to Lebec, despite his noted proficiency with early jump drives. Nul is a Classical Cepheid star, a yellow supergiant that swells as much as 10% – 15% its standard size at times. While it is an easy system to transit, the nature of the star makes habitation extremely difficult. The inner planets are complete write offs with regards to terraforming, and the outer planets have resultantly terrible seasons that prevent the development or import of even the simplest vegetation. In the centuries since Nul’s discovery, Humans have made three separate pushes to attempt terraforming operations. None have ever exited the study phase, with the immediate reaction of terraforming scientists being that the system is untenable for any sort of Human habitation. The most recent attempt was in 2619, and the system has faded into relative obscurity since then. Most analysts familiar with the system believe that there is no reason to visit its barely inhabited settlements and, given the danger presented by the star itself, no reason to even transit through the system. The opposite opinion, however, is held by the single worst group possible: slavers. In recent decades, Nul has become home to a traveling slave market, which assembles at various points in the system at seemingly random times and locations. Travelers are warned to avoid Nul at all costs; where there is sometimes honor among pirates, there is never any among slavers. The quickest ticket to a life of forced labor is showing up at an exchange with a cargo of unwilling captives and learning that your buyers are just as interested in taking cargo pilots. Nul is a Main Sequence Dwarf-G star. An uninhabitable dwarf planet being burnt away by the system's pulsating star. A large iron planet, too close to the star to be mined. Recently, the star's immense heat has cracked its surface, resulting in gas slowly leaking from its burnt mantle. 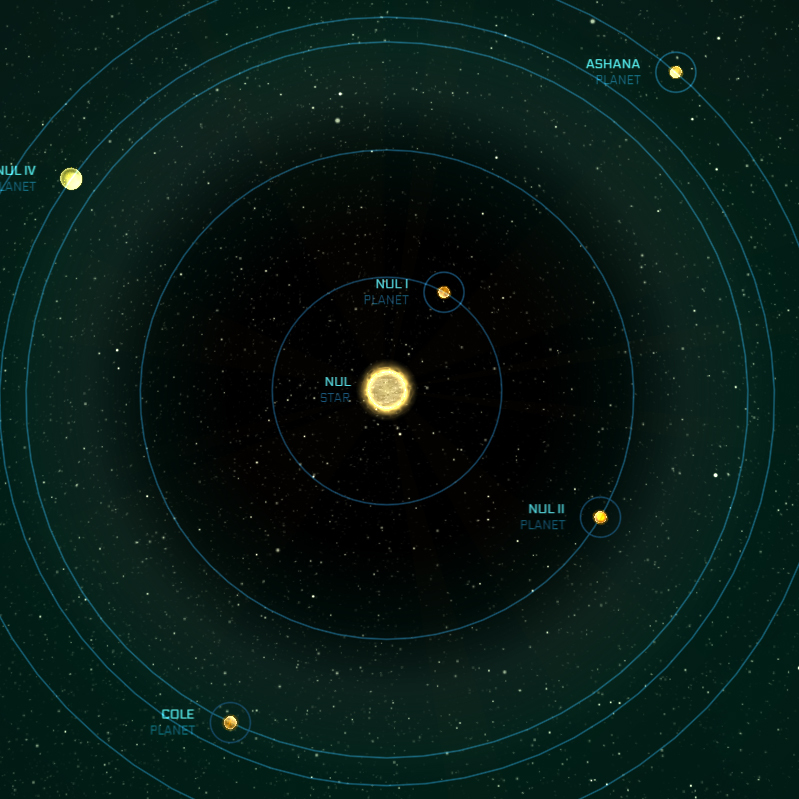 Located on the edge of the habitable zone, Cole's atmosphere is composed of ammonia and sulfur. Char, an abandoned research station has a small population and is the only landing zone. A gas giant suffering from a permanent electrical storm that makes refuelling attempts deadly. A massive desert world known for its strong winds and shifting sand dunes. The only landing zone on the planet is the wreckage of the UEES Olympus, now converted into an open black market for expatriates and criminals.